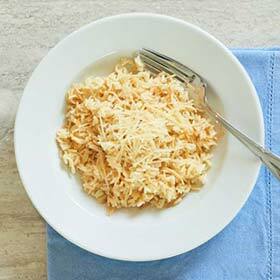 Sauté vermicelli and onion until golden brown, about 2 to 4 minutes over medium-high heat. Drain off oil. Add rice, stock, water, pepper and bay leaf. Cover, and simmer 15 to 20 minutes. Fluff with fork. Cover, and let stand 5 to 20 minutes. Remove bay leaf. Serving size: 2/3 cup. Amount per serving: 172 calories, 6g total fat (1g saturated fat), 4mg cholesterol, 193mg sodium.